* That Sadie has gone two nights in a row without diapers & no accidents!! Completely potty trained is a good feeling. * My new haircut. I went 10 weeks between haircuts....oh the horror. Much better now. * That the ladies behind me in line at the thrift store yesterday called my baby a "butterball" & "one big, fat baby." * General Conference. Always makes me want to do better & I really have Family Home Evening on the brain now. * That fall weather is finally supposed to be arriving here in Ohio. I've really been hating the 85 degree, super muggy days. I'm sick of being sweaty! * Taking Sadie to story time at the library. 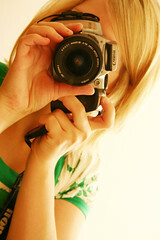 I really want to take a photo. None of the other parents are snapping pictures, so for some reason I think I'd feel really dumb. She LOVES it. Goes right up the the librarian & sits in front, then the rest of the kids join her. There's no holding back with the singing & dancing either. She's a fun girl. I'm sick of the mugginess too! It is SO hot here. Aubrey loves the library here too. They have fun story time options here. How do you get the labels to show on the right side of your blog, Candace? I want to do that to my blog. Great post! Yea for Sadie being completely potty trained! Too funny that those ladies called Claire a butterball...feels good I bet. I, too, have thought about taking a picture of story time, but haven't done it yet. We're going in a little bit, so maybe. Janae, you can add the labels to your sidebar under Template. Choose to Add a Page Element. Then choose Labels. I totally understand the feeling like it might be weird to take your camera when others don't do the same....I say WHO CARES! If you wanna picture do it! Remember I took my camera to the grocery? Unconventional photos are always the best! So happy that Sadie has been dry! That is a great feeling. And that is nice that Claire is chunkin up! Take the photos - for sure. I took the camera to the twins' first art class (no other camera happy parents there either) and I absolutely treasure the photos. Just go for it and enjoy. love that list! my little fiona enjoys storytime also, it is so fun to see her participate. thank you for stopping by petunia and leaving nice words. ooohhh . . . we are working on no diapers at night for 2 of our girls . . i can't wait!! I am jealous that Sadie is potty trained. Noah still doesn't want anything to do with it! HEY HAPPY BIRTHDAY!!! Your a awesome, inspiring, happy, funny, down to earth, GREAT FRIEND!!! i'm so happy we met that one day at church out in the hall and you were kind enough to let Lily borrow sadie's dress for pictures. Have a HAPPY DAY!!! Happy Birthday, Candace! You're a good woman. I know, cuz I've met you once. And you keep my cousin happy. And you have two beautiful girls.